Hi friends! 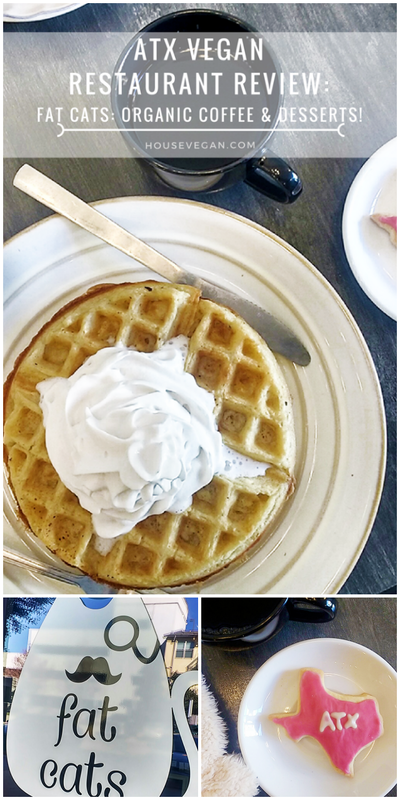 I recently met a dear friend for coffee and waffles at Fat Cats, a local vegan-friendly coffee house, and it dawned on me that you dears might like to hear about it. Fat Cats is known and loved among Austin vegans, but it hasn't made many "Must visit" or "Best of" lists which I think is a shame. To be fair, it's a little young compared to other popular establishments (it opened in 2014), and it isn't 100% vegan (though it is mostly vegan). I imagine that that sort of ambiguity may partially be to blame for its lack of buzz, but nonetheless it's a great little spot that I'm excited to share with you. 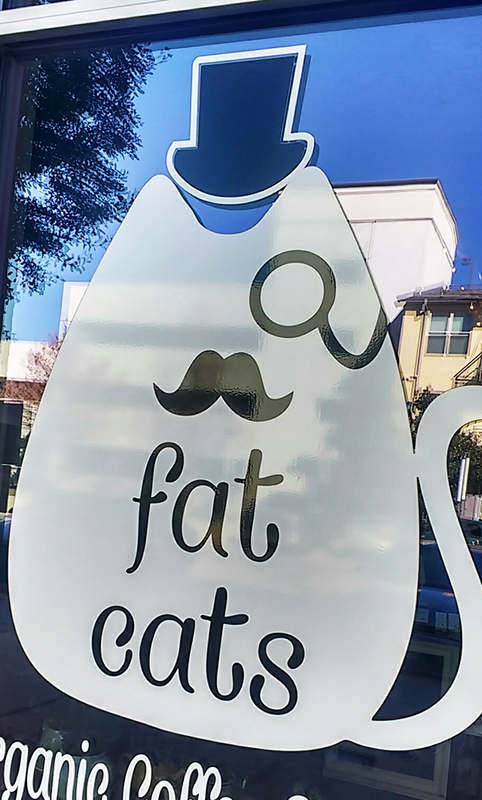 Fat Cats is located in North Central Austin in a complex filled with apartments, stores, and restaurants. The only downside to the location is that parking can be hard to come by during peaks hours. However, the complex is next to a train stop so that's convenient if you do public transit. Once you park and mosey on in you'll notice that the seating is a little funny. 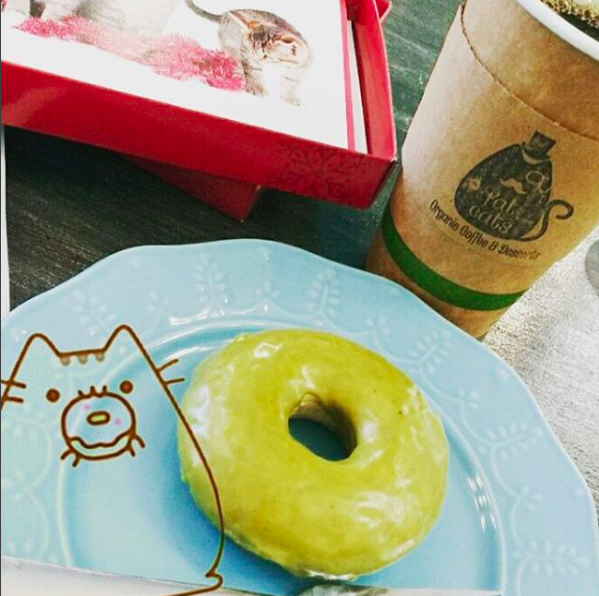 While Fat Cats isn't tiny, its long interior and large kitchen/serving space gives way for limited and impersonal in-store dining. While it's great for meeting a friend for coffee and pastries (or ice cream), it's not ideal for cozying up with a book or your computer. My friend and I have been here many times so we know the routine. I snagged a table as soon as I got there, and secured a place in line. I ordered my usual black coffee, and it came out hot and delicious. Fat Cats uses organic, fair trade, and locally roasted coffee beans from Third Coast Coffee, a company that I love. While they have a full espresso bar with a plethora of non-dairy milks and homemade syrups, nothing pleases me more than a hot cup of traditionally dripped coffee with nothing in it. Give me black or give me nothing! They're huge, and soft, and sweet, and perfect. 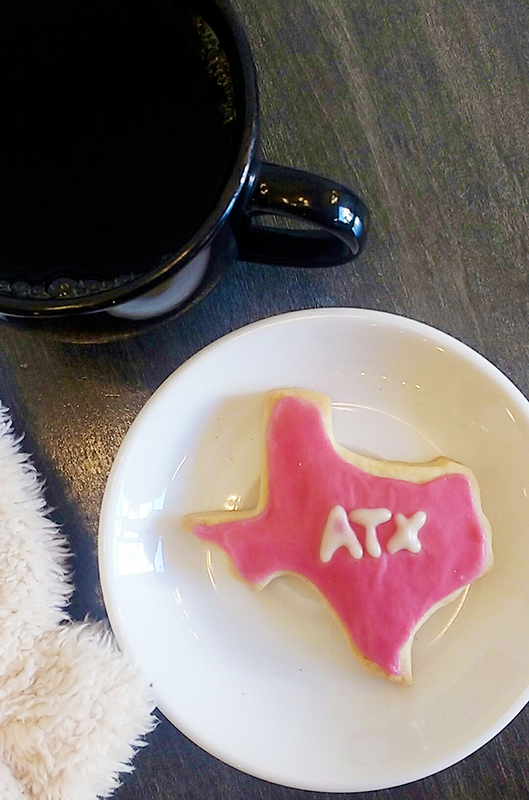 However, I will say that that adorable ATX cookie wasn't the best this time, sadly. I'm going to go ahead and blame the food coloring. You know how too much food coloring can sometimes leave a tinny aftertaste? It suffered from that. No worries, it won't deter me from continuing to love their cookies. 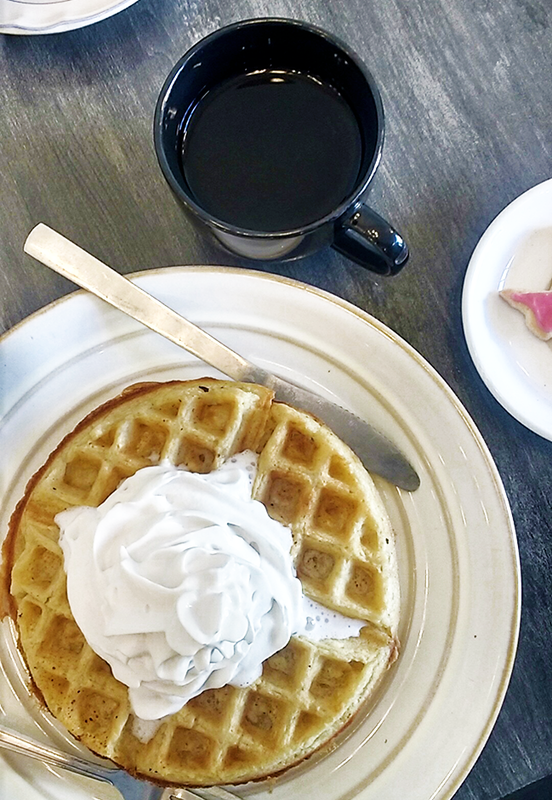 While I usually stick to the pastry case, I was feeling a little adventurous, and ordered a waffle as well. Their Belgian waffles are vegan, made to order, and big! You can get them with vegan butter, maple syrup, and fruit compote, but all I wanted was a vegan whipped cream mountain. 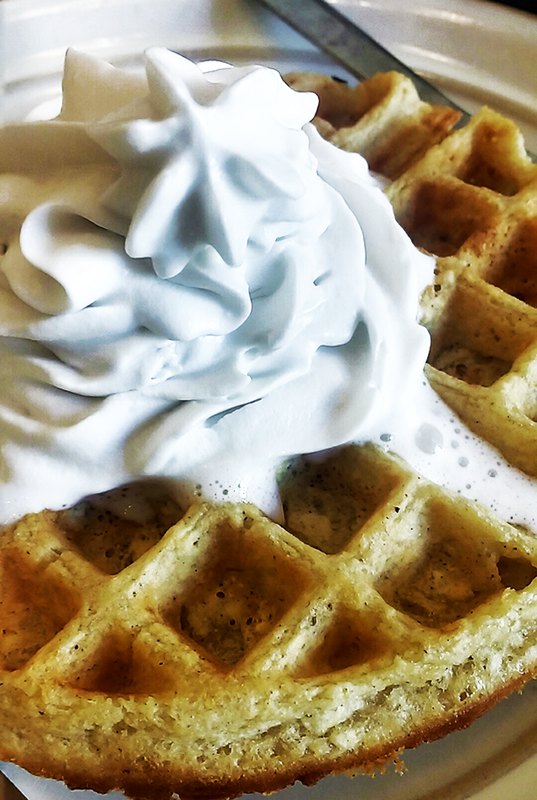 I got a whipped cream mountain which eventually turned into a whipped cream river flowing ever so deliciously through those wonderful waffle-y crevices. Man, this waffle was good. It was crisp on the outside, and fluffy and soft in the middle. I'll for sure be dragging my husband here for waffles. He's the waffle maker in our house, and it'll be nice to have someone make them for him for a change. Other than me, obviously. After receiving our food, and cleaning up a few coffee spills (I picked out the wobbliest table! ), my friend and I had a lovely time. There's something special about sharing coffee with a friend - more than wine or beer or tea. Maybe it's because I've been drinking coffee since I was a kid, but to me it's comforting and homey. 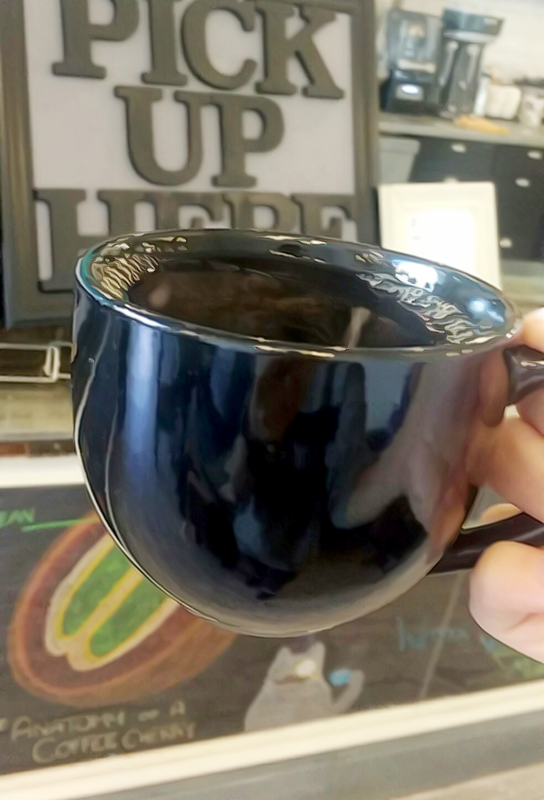 Coffee puts me in a state of openness and willingness, and if I had to rank my favorite things, coffee with friends and family would be really high on that list. 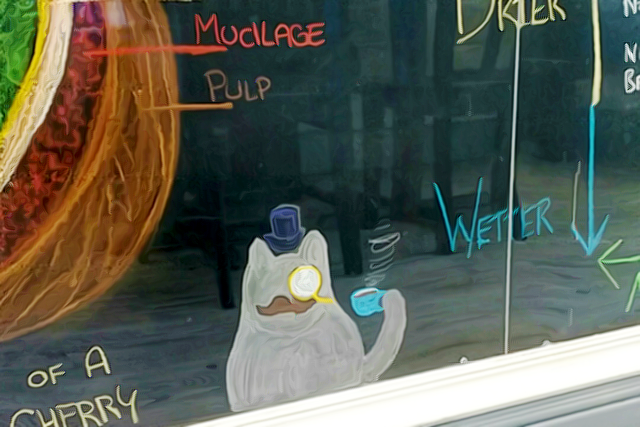 For years I dreamt of opening my own coffee shop, and in my dreams the menu was equal to Fat Cats'. You can tell that they truly care about their food and drinks, and that kind of attention to detail makes a difference in the customer's experience. Would I prefer a cozier space to curl up and read? Sure, but everything else about Fat Cats is so lovely, that I don't really care. 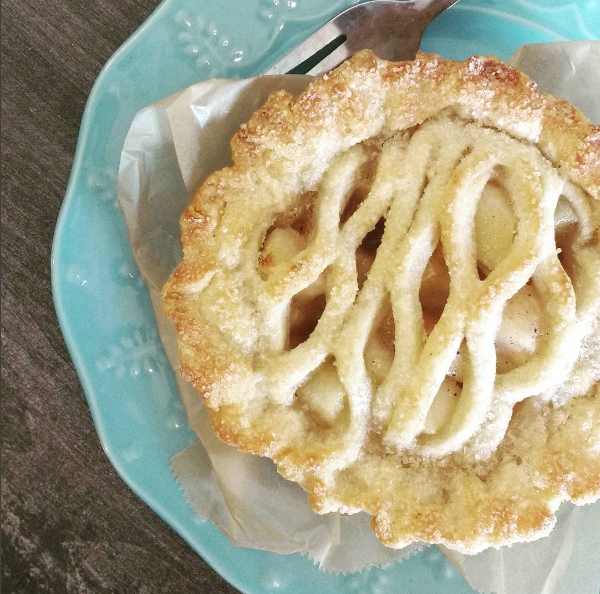 Owning a business in Austin is tough, and I want them to succeed. 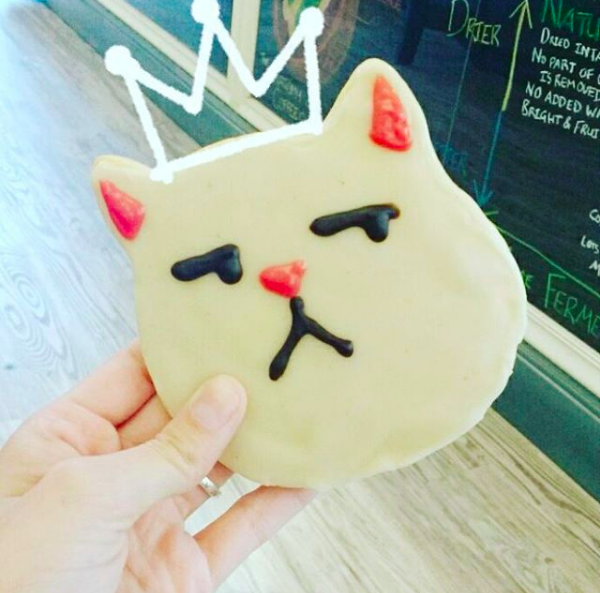 A tiny thing like "impersonal seating" will never deter me from visiting and ordering the best sugar cookies that are the size of my head. As I mentioned before, they aren't vegan but they are very vegan friendly. Every drink on their menu can be made vegan, all of their pastries are vegan, and they have two ice cream cases - one vegan and one dairy. While I'll prefer coffee forever and always, they have a really huge tea menu. Just fyi if that's your bag! Some people have complained about it being pricey, but I think it's pretty competitive to other similar businesses. Especially considering that they use top quality ingredients.